Yachts For Sale. Yachts For Charter. Personal Yachts. 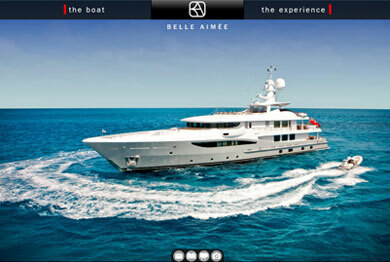 CREATION: We create, manage and implement media and marketing solutions for yachts and affiliated companies. Power yachts & Sailing yachts. Large and small. INNOVATION: We are hands-on web coders, graphic designers and programmers with over 30 years yacht industry involvement and over 15 years of actual web development and print design. EXECUTION: We prioritize based on materials and budget. There are no middle management layers between you and your project. EMPATHY: We are very familiar with international and domestic marine markets with a full awareness of nuance, relationships, and how to "size up a yacht" for yacht charters and yacht sales needs. NOT BROKERS: We are not yacht brokers. We do not offer yacht broker and charter broker services. YACHT OWNERS, CAPTAINS & AGENTS: Our services are leveraged for yacht owners, boat builders, yacht architects, yacht captains, & yacht agents. Employment: We are hiring the "right bright" individuals with demonstratable skills.